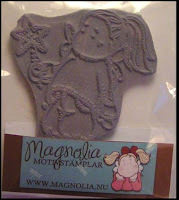 This week's Prize, supplied by Crafty Krafts is a Tilda Stamp. Everyone who takes part in this week's challenge by ( 10pm Monday the 7th of July GMT) will be entered into a prize draw and 1 lucky person's name will be selected at random. Come back next week to see who won! I created a spring/ summer theme card using stamps from the OneFourZero butterflies theme plate and colouring the images with distress inks. I put the butterflies onto foam pads for dimension and created some faux stitching between them. 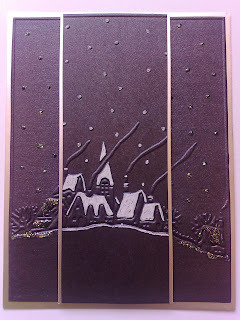 I embossed the CB winter houses on to black pearl card twice. I cut a strip from one of the embossed pieces and highlighted some of the raised areas with a white gel pen, then mounted this onto silver card. I put 3D foam tape on the back of this strip and mounted it on to the other embossed piece making sure the images were lined up. 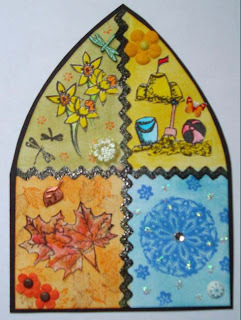 I then mounted this onto a silver card blank, and highlighted the back image with a little clear glitter glue. 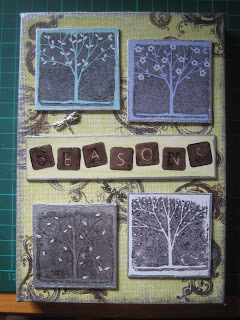 I made 4 ATCs for the seasons challenge, one showing each of the seasons! 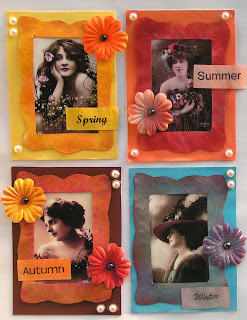 I used some beautiful vintage images, made a frame for each and distressed with various inks. I then popped a paper flower on them and picked some colours which made me think of each season: oranges, yellows, browns and blues. 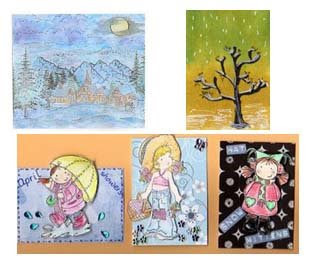 I inked the background in 4 sections with Distress Inks, then stamped, coloured and cut out various images suitable to each season, and added them to the sections with some embellishments. I stamped a ric rak stamp down and across to divide the sections. For my card I decided to do my favorite Season - Autumn. I love the colours and smells of Autumn. 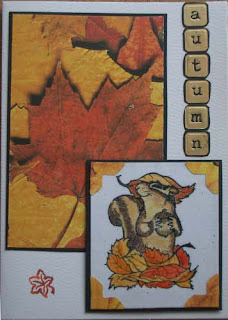 I have used an unknown make unmounted stamp of a squirrel and an oddment of some leaf background paper. Letters from a pre printed alphabet I had hanging around spell out the word Autumn. Hi everyone! 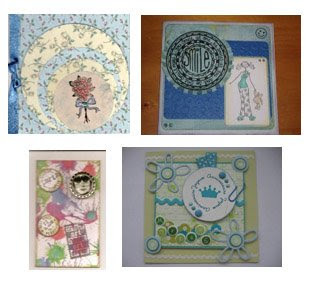 Thankyou for taking part in last week's challenge, It's time for a new challenge and the theme this week is 'Circles'. 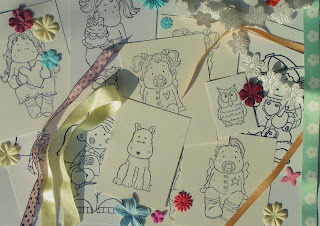 Crafters Companion has given the design team a set of Cute Companions stamps by Jayne Nestorenko and we all really loved using them. It's up to you what you make for this weeks challenge. 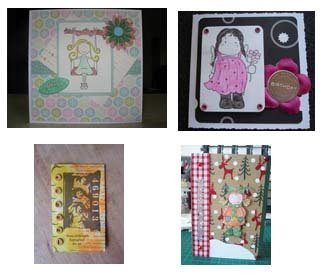 Perhaps a Card, Tag, ATC, Skinny, Scrapbook page, Fatbook Page (4x4) Gothic Arch, Moo Mini card, Skinny, Inchie or Altered art. Leave us a link to your blog so everyone can see what you make! 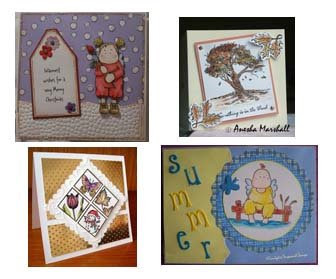 Congratulations to Bev you have won last week's prize! Please email us your details and we will post you your prizes. 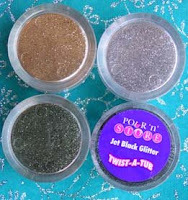 This week's Prize, supplied by Crafters Companion, is a selection of 4 Pour 'n' Store Glitters - in Jet Black, Sage Green, Silver & Gold. Everyone who takes part in this week's challenge by ( 10pm Monday 30th of June GMT) will be entered into a prize draw and 4 lucky persons names will be selected at random each winning one glitter each! We will announce the winners next week! 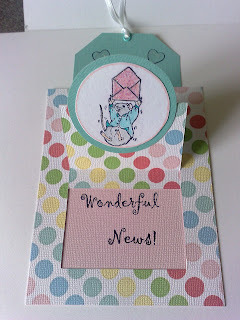 I covered my card in patterned paper that has circles on it and added another strip in different colours! 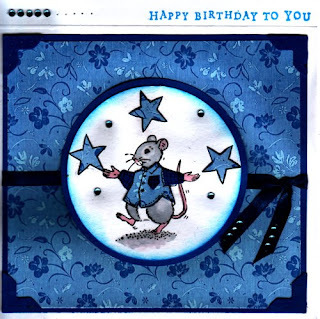 I stamped the Mouse image and watercoloured him in with Marvy Le Plumes, and matted him onto the card. 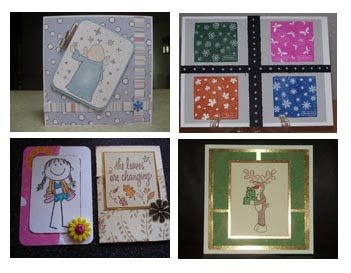 I stamped the greeting and matted that also, then added some green Primas with Copper Stickles for the centres. I started by cutting two circles with the cricut. 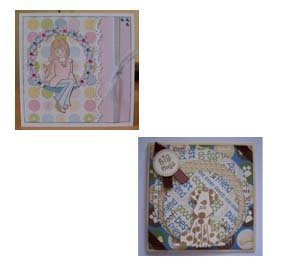 Then I stamped them both with images from Jayne Nestroenko. I then coloured the mouse in with watercolour pencils. The circles were then matted onto red DCWV paper. Some ribbon was added to the edge of the large circle, a paperclip and red acrylic circles added. 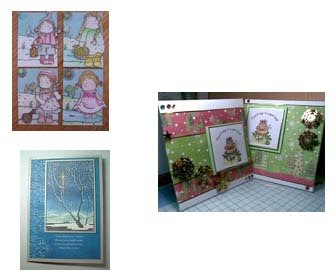 I got the instructions for the surprise pop up card here http://www.splitcoaststampers.com/ee/index.php/resources/tutorials/surprise_pop_up_card/ and although I didn't follow them to the letter the basics of how it works is there. All the stamps used are from the Cute Companions range, which I stamped in black archival ink and coloured with prisma pencils, blended with sansodor. I highlighted some areas with clear glitter glue. I needed to make a tag for a friends present and so put together this simple design. 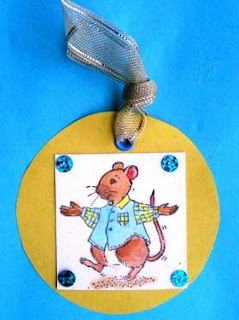 I cut out a circle in yellow, watercoloured my little mouse and added an eyelet with some gold ribbon. I finished off with some blue sequins. This week I was sent these wonderful little Cute Companion Mouse and star stamps to make my card with. Funny because I already have the Cute Companion CD and the stamps are moving up my wish list! I have printed some backing paper from the CD and I have stamped the little mouse and stars on a circular topper. His little shirt and the stars are paper pieced and I have water coloured the rest of him. 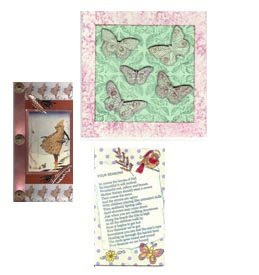 Embellished with blue gems, satin ribbon and stitched photo corners. I stamped my little Cute Companions mouse stamp and paper pieced her dress. 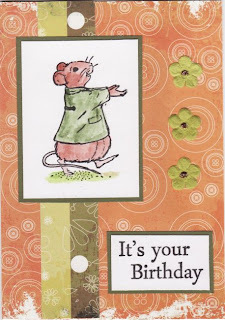 I stamped the little rose and placed it in the mouse's hands. 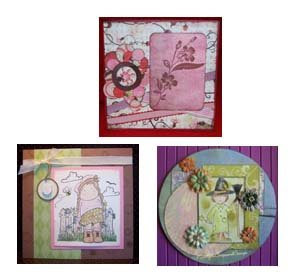 I matted her onto a circle tag and chose some patterned paper with circles on. I added a few (!) 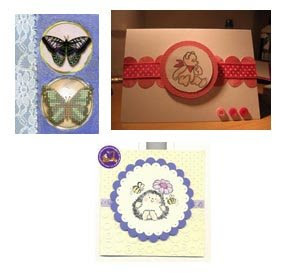 embellishments and a Cute Companions Thank You sentiment. Congratulations to Den you have won last week's prize! Please email us your details and we will post you your prizes. 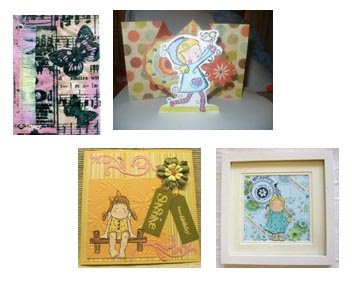 This week's Prize, supplied by one of our design team, Kate, is a selection of some stamped images. Everyone who takes part in this week's challenge by ( 10pm Monday 23rd of June GMT) will be entered into a prize draw and 1 lucky person's name will be selected at random, winning everything seen. 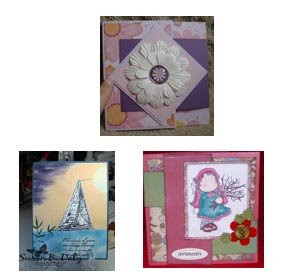 For my card I have used a K & Co striped paper, yellow card, pink card and pale grey card. The stamps are Elusive Images and they have been embossed in silver detail embossing powder. 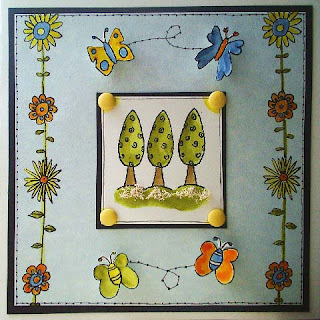 I have added buttons and twine to the centre of the flowers and attached 3D to the base card. I have embellished with a pink flower buckle and silver grey organza ribbon. I coloured Tilda with distress inks and matted her on top of various patterned papers which I doodled around. I sewed buttons onto the card and also stitched the stem of the flower. The buckle is a chipboard sticker threaded through ribbon. 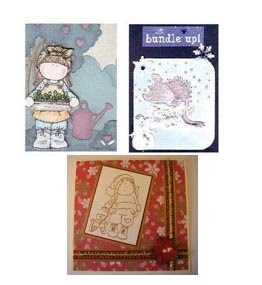 I stamped a Little Cotton Rabbit image and water coloured and Stickled her. 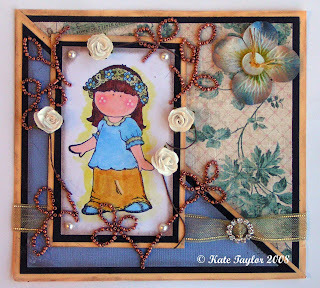 I matted her onto my card, together with a Penny Black greeting, and some buttons and sparkly gems. I used peeloffs for the name, and some lilac grosgrain ribbon to go through the buckle, and finally added a large silver number 1! I cut an oval of cream card and stamped Tilda with black archival ink in the centre. I paper pieced Tilda's dress & bow and coloured the rest of her with prisma pencils blended with sansodor and highlighted her with iridescent medium. I glued buttons around the edge of the oval. I stuck patterned paper to a 4x4 piece of mountboard and then glued the oval centrally. I doodled around the edge of the page and hand wrote 'for you' in brown felt tip pen. I watercoloured a Hanglar image and used black, cream and blue card stock, as well as some K & co floral paper. I added some paper roses and a distressed a large paper flower with inks. I embellished with some adhesive pearls and then added a pearl button to the center of my flower. I then added a diamond buckle & gold ribbon. I finished off by drawing a leaf pattern and carefully glueing on some bronze beads. 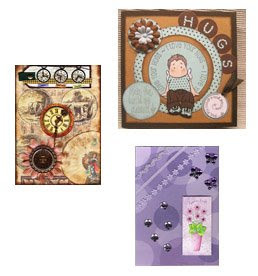 I started by stamping the words and leaves and buttons with vintage sepia versafine. I then cut out the leaves. For the backing paper I used K & co button paper. I added glossy accents to random buttons on the paper. 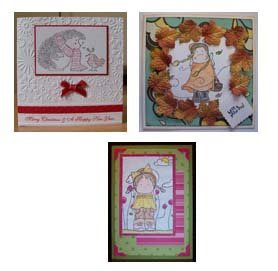 The card was finished of with cream ribbon and a gold buckle cut with the quickutz.